Washington D.C. was buzzing with activity this morning. The rather by-the-book Supreme Court confirmation hearing of Judge Neil Gorsuch and Federal Bureau of Investigation James Comey's testimony before the House Intelligence Committee. The two big revelations: the FBI is investigating possible collusion between the Trump campaign and the Russians. Second, the Department of Justice was not wiretapping Trump Towers. No surprise. Stay tuned, more will be revealed. Alright, onto to today's subject inequality and poverty. Here is another non-surprise, income inequality has dramatically risen in the United States since the early eighties. This fact is linked to worsening health, higher rates of violence and minority incarceration, limited upward economic mobility. Richard Florida reports in his CityLab article, "America's Economic Distress Belt" reports, "But until recently, a county with higher inequality did not necessarily have a high concentration of poverty." A new study, Poverty and Inequality Pervasive in Two-Fifths of U.S. Counties, by Beth Jarosz and Mark Mather, published by the Population Reference Bureau, follows the rapid growth in inequality across over 3,000 American counties over a two-and-half decade study period. Mr. Florida reports, "Today, 41 percent of U.S. counties suffer from high levels of combined poverty and income inequality, up from just 29 percent back in 1989." Shocking. The table at the left presents a worse situation, "...just 28 percent of counties have low levels of poverty and low levels of inequality." 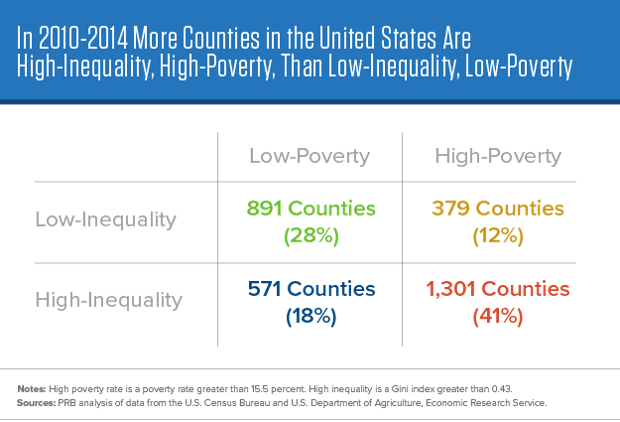 In short, "...more than 70 percent of counties have either high levels of inequality, high levels of poverty, or both." 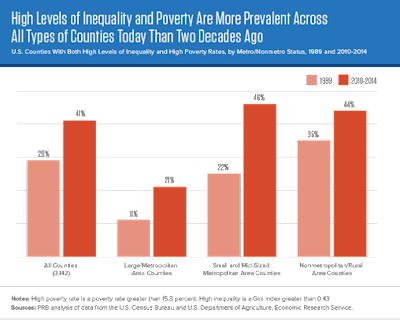 All Types of Counties Today Than Two Decades Ago"
The bar graph on the left-hand side charts the level of inequality according to type of counties: large metropolitan counties, small and medium-sized counties, non-metropolitan and rural counties. 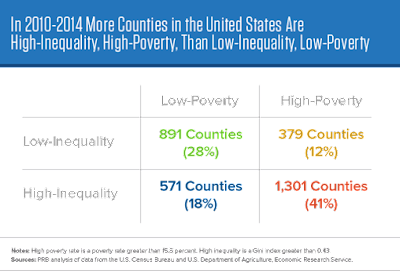 Looking at the numbers for metropolitan counties (the second to the left), the pink bar represents "...11 percent of large metropolitan counties suffered from high levels of inequality, a figure that grew to 21 percent by 2014 [the red bar]." 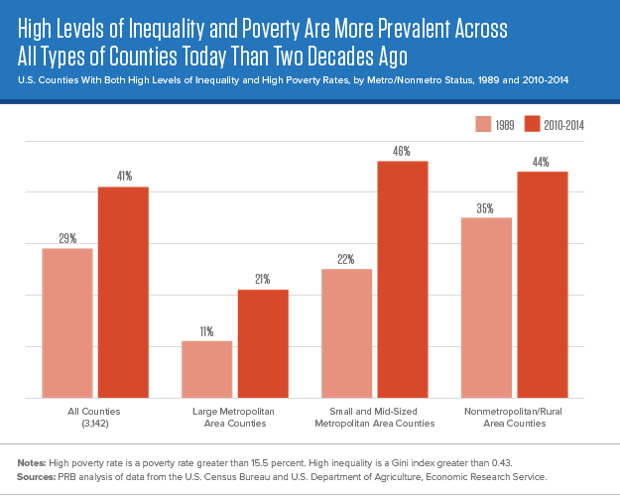 In the small and medium-sized counties "The combination of inequality and poverty increased from 22 percent to 46 percent of small and mid-sized counties and expanded from 35 percent to 44 percent of rural and non-metropolitan counties over that same time period." and Poverty Has Increased Over Time"
The time lapse map follows the increase in poverty and inequality throughout U.S. counties. 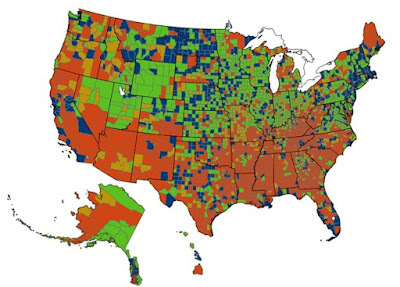 The green signifies counties with low poverty and inequality, gold stands for low inequality and high poverty, blue is low poverty and high inequality, and red signifies the alarming rate of high inequality and poverty. Over time, large swaths of the map turn red. Mr. Florida writes, "Today, the health pockets of green (representing low inequality and low poverty counties) are limited to Midwest and Mountain regions of the country, along with parts of the Mid-Atlantic." However, the Sunbelt states (eg. Southern California, Arizona, Texas, and South Carolina), in particular, has become America's economic distress belt, with high rates of inequality and poverty. Although some pundits continue to laud the Sunbelt's rapid growth and low housing costs, an increasing numbers of people and places are falling behind "in absolute terms and compared to the rest of the country." The bottom line is inequality and poverty are beyond class issues, they extend to geographic issues, as well. Is This The Way To Make America Great?